This mini dirt bike looks like a full size dirt bike!! 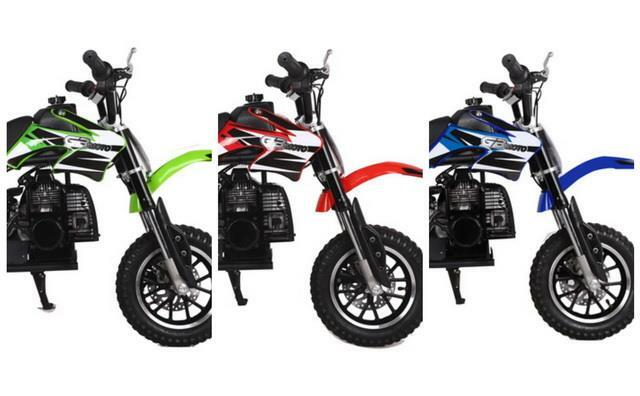 It provides great features like front and rear disk brake, heavy duty rear shock, high performance 2 stroke exhaust, light weight alloy rims and an automatic transmission. It is very sharp looking, reliable and inexpensive! Ideal for young riders with no prior off-road motocross experience. The 2-stroke engine provides strong horsepower, low traveling noise and long service life. We paid great attention to the balance of our dirt bikes. Frame, front fork, suspensions and tires are special designed and tested. You will have smooth and comfort ride experience with our balanced bikes! Mechanical knowledge and skill are REQUIRED to use and maintain this bike or replace the parts, or contact us before purchase it !